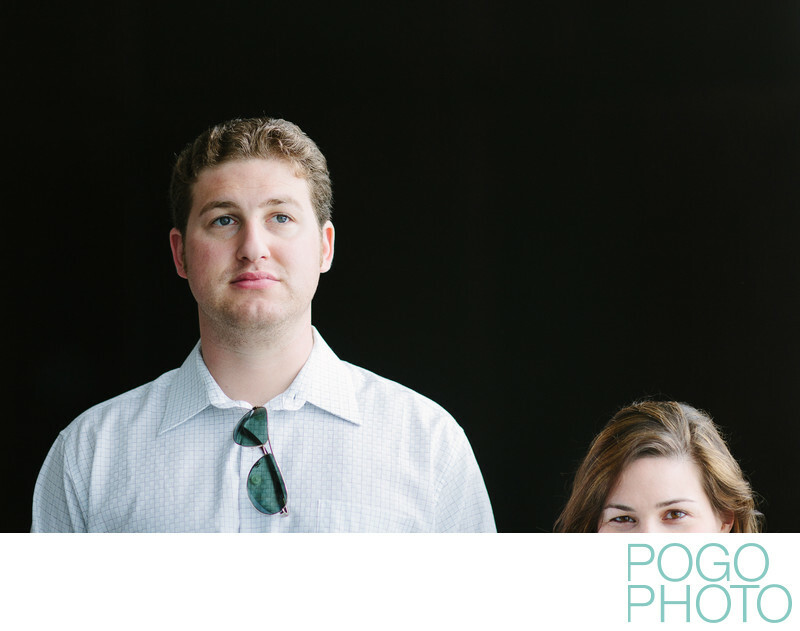 Maressa and Dan have one big difference: their height. Even on a tall day she's barely up to his shoulders, but of course this doesn't make the slightest bit of difference to their relationship, which is warm, loving, and friendly. Highlighting this difference in this portrait allowed us to sneak a bit of humor into some pre-wedding portraits during their rehearsal at the Eden Roc, and the starkness of the dark background is softened by the flattering daylight coming from enormous picture windows in their ceremony space. Seeing Dan's casual attire and classic aviator sunglasses while being left to wonder about what Maressa might be wearing adds an element of uncertainty and amusement, especially given her slightly mischievous look in her eyes contrasted with his stoic expression. Images like this give us a giggle, as they throw the viewer off balance momentarily. Many of our images are planned in some way; we may learn a technique, think up a situation to spin, or may acquire new equipment to give a new or interesting effect to our images. But the vast majority of our images are created on the fly, as inspiration strikes us. We can never predict what might move us, just as we can’t predict what your relatives might say, how you will react, or what the weather will do on your wedding day. What we can promise is that no matter what happens, we roll with it, and love every moment. You’ll see us smile, maybe frown with concentration, and light up with inspiration. This is the nature of being documentary artists, and the exciting and wild delight that comes from working within this field as wedding photographers. Location: Eden Roc Hotel, Miami Beach, Florida. 1/500; f/2.0; ISO 400; 85.0 mm.